Louisiana Cat has full-service Marine specialized locations in Morgan City, Harvey, Darrow, and a marine parts location in Port Fourchon. In full support of Cat Propulsion products, Louisiana Cat has a dedicated service facility in Houma, La. on the intercoastal waterway with dockside capabilities. To round our locations out, our Power Systems headquarters is located at the Port Of Iberia. Our Morgan City location offers convenient access to the Intracoastal Waterway, the lower Mississippi River and the Gulf of Mexico ports. We also have fully trained marine technicians at other locations throughout the state ready to serve our inland waterway customer base. Louisiana Cat's highly trained commissioning and field service technicians have significant offshore experience with passports, TWIC cards and safety certifications enabling our customers to receive skilled product support services anytime, anywhere. Our service facilities and operations are DNV Platinum certified, providing our customers with the highest level of service excellence. Our custom packaging facility in New Iberia is ISO 9001 certified showing our commitment to quality and ongoing improvement of our quality system. Click Here to review our ISO 9001 Certificate. Louisiana CAT is committed to providing products and services of the highest quality utilizing the most dependable and advanced technology to our Customers. Read more on our Quality Policy Here. Engineering – Louisiana Cat’s engineering staff are experts in their field providing our customers with technical advice and customized computer-generated drawings. Whether providing complete development services or support for a project, we have engineering capabilities to meet your needs. 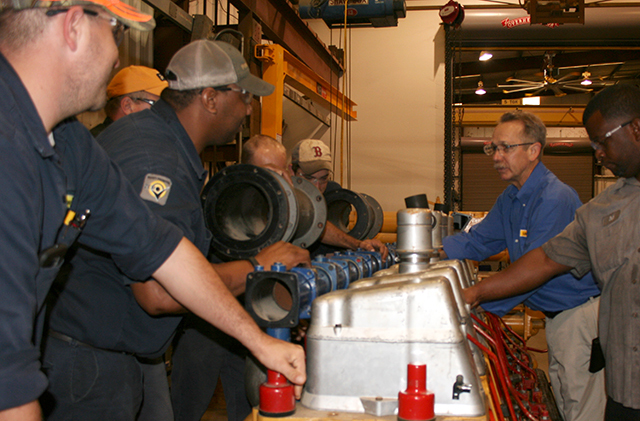 Hands-on Technician Training – Louisiana Cat provides hands-on technician training at our Training Facilities in New Iberia and Morgan City. These classes provide a compr ehensive understanding of both diesel and natural gas engines. For our Training Schedule and details on the classes offered, Click Here. Cutting Edge Monitoring Systems – Louisiana Cat’s premier Product Health Center now provides PRODUCT HEALTH CONNECT®, a self-contained monitoring and display system keeping you connected by providing key data, and PRODUCT HEALTH COMMAND®, a touch screen management portal allowing you total command over your engines and generators’ on-board performance and maintenance viewable online, anywhere, anytime. Both CONNECT and COMMAND deliver critical engine data that is easy to read and understand, ensuring maximum vessel productivity. This Hi-Tech State of the Art facility in New Iberia, LA is equipped with a team of people whose sole interest is to provide you with the most “up-time” possible and the goal of reducing your Owning & Operating costs. At Louisiana Cat we focus on you, the customer, and the reliability, safety and profitability of your business. It’s this focus that drives our own business and dictates how we work together on a daily basis, because when a highly skilled, experienced team all pulls in the same direction … that’s when great things happen. Stories from the Sea brought to you by Caterpillar® Marine! Louisiana Cat invites you to travel with us around the globe through Caterpillar’s premier Free Marine publication, Wake. We are all connected in some way, and every step we take, every new encounter we have and every new connection we make can lead to new possibilities. Learn from marine customer stories how Cat engines have helped our customers in applications all over the world. Fill in the form below to subscribe to Wake!